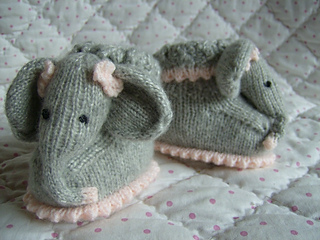 An easy quick knitting pattern on straight needles to make a warm, stay on pair of cute little Elephant bootee/slipper pets. A useful way to turn remnants of any DK yarn from your stash into a treasured fun item. You are absolutely welcome to display/fundraise/donate/sell for profit any items knitted from this pattern with my blessings. 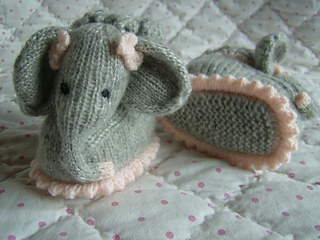 Only the pattern itself is my copyright which may not be reproduced in any form. Thank you.